This week’s Commit to Fit Challenge was a whole lot easier than last week’s squats challenge. 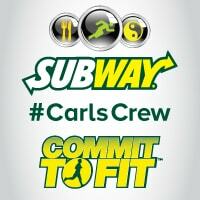 Carl Savard, the SUBWAY Canada Commit to Fit Ambassador challenged Carl’s Crew to go to bed 30 minutes earlier than usual. As someone who actually likes hitting the hay early, I was very happy to see a challenge that I knew I could manage. I know I often say that there aren’t enough hours in the day to get everything done. Rather than stay up into the wee hours of the early morning, I’d rather get up extra early and start tackling my to-do list. I find I’m much more productive in the morning. I hated doing all-nighters when I was in school. I remember one time I was late for an exam because I slept in after staying up all night studying. Talk about freak out! We need an adequate amount of rest to give our bodies energy and to control appetites. I find that I’m always hungrier at night and that’s usually the time when I give into my cravings. I have much more self-control during the daylight hours! Carl also suggested replacing time in front of a screen (ie. computer, TV, phone, tablet) with reading a book or quietly relaxing before bed. We don’t have a TV in our bedroom so there is no temptation in that regard. However, I’m bad for staying up and playing Candy Crush in bed, but at least you only get five tries before your lives run out. I already read every night in bed. I find it makes me tired and I usually fall asleep right away as soon as I put the book down. Another suggestion Carl gave was to not set an alarm on the weekend to allow our body extra resting time. I noticed that I got up about the same time I normally do even without the alarm. I guess I’m just used to getting up at that particular time. Check out my previous challenge posts for Week 1, Week 2 and Week 3. I am a confirmed night owl! Maybe it’s because I work a lot of night sifts and have gotten into that pattern. I like being an early bird but sometimes my body forces me to be a night owl. I will enjoy this challenge like nothing I have ever tried before Thanks! I am actually both. I love staying up late so that I can have some me time once my toddler falls asleep. But of course he gets up early so Iam up early. I’m an early bird; most productive during the morning hours. But when the creative spirit hits me, its always in the wee hours of the night.